Everyone agrees with this statement as we are encouraged to eat five portions of fruit and vegetables, including salads, every day. Salads provide an essential source of vitamins, minerals, anti-oxidants and fibre, as well as being a delicious meal or accompaniment to meals. So why are we telling you to never eat a salad naked? As people become more aware of healthy diets, the desire for low fat, low sugar or low salt meals and ingredients increases. This is especially so with oils, mayonnaises and salad dressings as ‘low fat’ or single calorie sprays become increasingly popular. 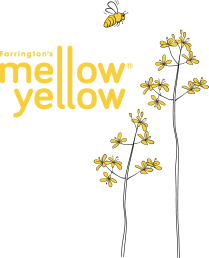 At Farrington’s Mellow Yellow we often speak to customers who are keen to eat a healthy low-fat diet, to the extent that they don’t like to put salad dressings or mayonnaise on their salad with the aim of reducing their fat intake. The logic and ambition may be good, but a quest to reduce calorie intake by eating a salad un-dressed actually deprives people of the fantastic health promoting nutrition locked up in the salad. Not only is a fat required to absorb the nutrition within a salad, dressing a salad makes it more interesting and delicious to eat, helping you to make it a regular and enjoyable part of your diet. Also consideration should be given to the choice of fat used, but more on that later. Salads are a wonderful source of vitamins and carotenoids. Vitamins play vital roles in health and body metabolism, along with their interaction with minerals required in the diet. We need to take vitamins in small regular amounts in our diet as the body can not store them and they can even be harmful if taken in excess. Vitamins are either fat soluble or water soluble, with Vitamins A, D, E and K being fat soluble. Salads contain fat soluble vitamins, so unless a salad is dressed with an oil-based dressing or mayonnaise, it is very difficult for the body to absorb these vitamins. By eating a healthy, balanced diet, there is no need for vitamin supplements to be taken. Carotenoids are fat-soluble compounds so, just like the fat-soluble vitamins, to get the best nutritional benefit from colourful salad ingredients such as peppers, carrots, spinach and tomatoes, dress your salad with a fat to allow your body to absorb the carotenoids. However, research has shown that the type of fat eaten also affects how well we can absorb carotenoids from food. For example, a salad dressing made with an oil rich in mono-unsaturated fats, such as cold pressed rapeseed oil, absorbs more carotenoids compared to a dressing made with oils rich in saturated or poly-unsaturated fats, such as soybean, palm, sunflower or coconut oils for example. So not only should you ensure your salad is dressed with a fat, you should try to ensure the fat is rich in mono-unsaturates. But as far as the clothing you chose to wear, or not, while enjoying your favourite salad, we’ll leave that up to you. * Crude rapeseed oil contains up to 95 mg/kg carotenoids, comprising about 85-90% luteins and 7-10% as carotene (Gunstone 2004). Extra virgin olive oil also contains luteins and carotene, but at levels of up to 20mg/kg only (Bosku, 2009) i.e., it only contains around one fifth the carotenoid antioxidant properties of rapeseed oil. Bosku D., (2009). Olive oil Minor Constituents and Health CRC press p52. What are fats and what are the differences? What are the health benefits of cold pressed rapeseed oil?